The TV Shield PRO Lite TM is a sleek cost effective protective TV enclosure built using lightweight aluminum for ultimate strength and durability. Perfect for indoor TV protection or outdoor applications that need strong screen defense rather than full weather-proofing, this cover is ideal in high traffic buildings, institutional environments, schools, hospitals and more. The unit's base frame bolts to the wall using heavy duty mounting hardware, while the enclosure attaches to the base frame using a high strength security screw system for the ultimate defense against removal from the wall (this is an open back design). 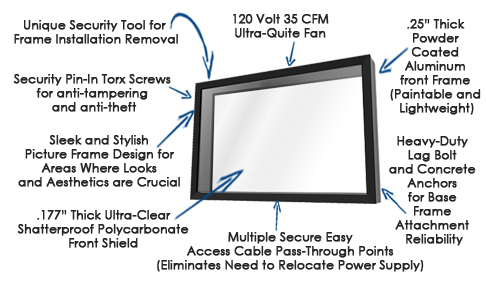 The TV Shield PRO Lite ® features .177" thick ultra-clear shatterproof polycarbonate for the front shield and a .25" thick aluminum front frame. This protective TV and digital display enclosure will hold up in the roughest and toughest environments including federal correctional institutions. 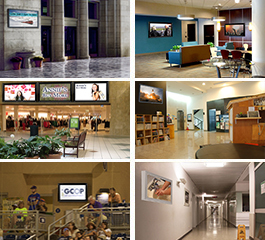 Protective Enclosures Company is the leading US manufacturer of protective TV enclosures and PEC's enclosures are currently used in over 6500+ locations in 16+ countries!